Shelby Baron has never experienced what it’s like to walk, but she is quite familiar with what it’s like to win big. Baron is in her second year of graduate school. 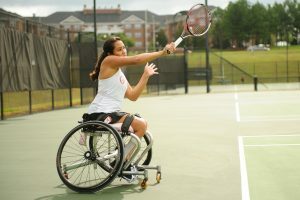 Baron, a 23-year-old graduate student studying speech pathology at The University of Alabama, has been a member of the Team USA Paralympic Wheelchair Tennis Team since 2010. She is also the first person to receive a full Adapted Athletics tennis scholarship to UA and has won three national championship titles with the University’s Adapted Athletics Wheelchair Tennis Team: 2015, 2017 and 2018. The Hawaii native said it’s hard to believe what she’s accomplished, considering her only goal when she got into tennis at age 10 was to get some exercise. Baron was born with spina bifida, a congenital defect that affects the muscles and nerves in her back down to her legs. But thanks to a highly supportive family, she never felt like there was much she couldn’t do. “My mom and family have been really big supporters in helping me do anything I’ve wanted to do,” she said. When Baron was 15, she went to a junior tennis camp in California. 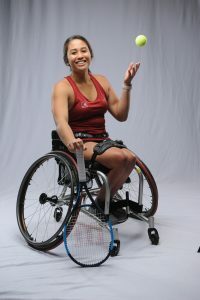 That’s where she learned she had the potential to compete against other wheelchair tennis players. 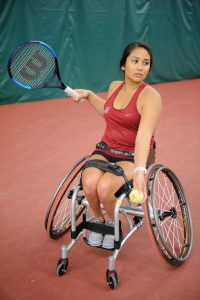 At the camp, nationally acclaimed tennis coaches encouraged her to compete in international wheelchair tennis tournaments. She followed their advice and did well. UA Adapted Athletics Director Brent Hardin recruited Baron to the Capstone. “It took that first tournament to realize how much potential I had,” she said. “My first tournament was in Taiwan and I won the doubles with my partner and went to the semi-championship in singles. In her first two years of college, Baron attended the University of Hawaii. During her sophomore year, she came to a crossroads: pursue tennis full time or continue her education? That conundrum was quickly solved when she played in her next tournament. There, UA Adapted Athletics Director Brent Hardin saw her play and recruited her to the Capstone. “I came to this prestigious school my junior year and I love it,” Baron said. “I’m a big fan of all types of sports even though I only play tennis, so transferring over to the school with the No. 1 football team in the nation and being surrounded by athletes is so much better. Baron said her biggest joy in transferring to UA has been finding other students like herself. Being surrounded by people who can relate to her struggles, her lows and highs, has meant the world to her.